Apple is making it easy for anyone, not just those part of its paid developer program, to access beta builds of OS X and in the process submit feedback to Apple. As noted by The Loop, Apple is kicking off a new OS X Beta Seed Program today for all customers that will allow anyone with an Apple ID to install beta builds of OS X starting with the latest OS X 10.9.3 build released yesterday. The OS X Beta Seed Program gives users the opportunity to run pre-release software. Test-drive beta software and provide quality and usability feedback that will help make OS X even better.The OS X Beta Seed Program gives users the opportunity to run pre-release software. Test-drive beta software and provide quality and usability feedback that will help make OS X even better. 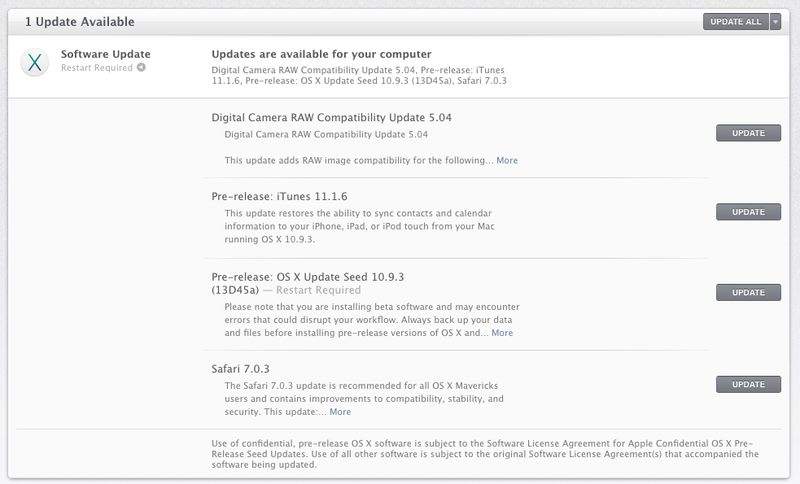 You can sign up for the program here and Apple says it will provide a Beta Access Utility for Mac that will give pre-release access to the OS X betas via the Mac App Store Updates panel (as pictured below). Those in the new program get access to a lighter version of the Feedback Assistant but they don’t get all of the benefits of Apple’s other seed programs like detailed bug forms, full release notes, and a discussion board.